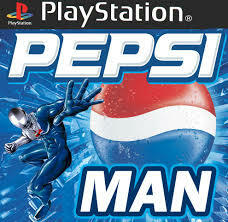 Pepsiman (ペプシマン?) 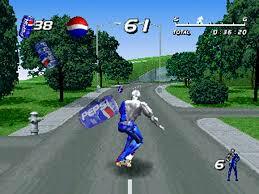 is a 1999 Japanese video game for the PlayStation based on the marketing mascot of Pepsi called Pepsiman. Mobygames described the gameplay: "This game is based on the Japanese Pepsi mascot who appeared in different commercials in Japan. In these he appeared where people were thirsty, quenched the people's thirst, then injured himself most of the time. 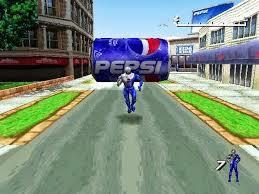 The game more or less follows this series of events as you run along stages collecting Pepsi cans, while trying your best to avoid injury or public humiliation. The goal of every stage is to run along a set course, jumping or sliding out of harm's way and in the end reach a vending machine with... you guessed it! Pepsi of course!" Always check FAQ if you have a problem!